Here is one of our homemade inventions. 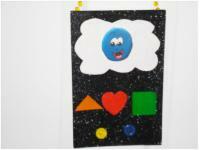 Its ultimate function is to program sweet dreams as part of children's bedtime ritual. Pressing a series of colourful "buttons" and adding a smiley face each night has been known to perform miracles when it comes to putting an end to bad dreams! 1. Gather your materials. You will need two colors of Fun Foam (I am using the glitter foam again, I love it! 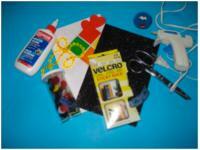 ), scissors, buttons, a few shape stickers, Velcro, a bead necklace, white glue, hot glue, and a smiley face (see "Emotions characters" in the educatall club). 2. 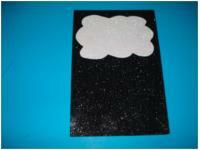 Cut a cloud shape out of one sheet of Fun Foam and glue it at the top of the other sheet. 3. 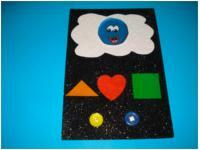 Invite children to add the shape stickers and buttons under the cloud shape. They will represent the buttons which must be pressed each night to program sweet dreams. Add a piece of Velcro in the center of the cloud. 4. Add the opposite Velcro piece behind the smiley face so children can stick it on the cloud after pressing their series of buttons. 5. Turn the Fun Foam sheet over and apply hot glue in the upper corners. 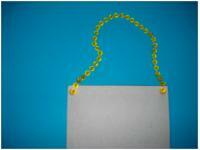 Press the ends of the bead necklace in the glue. 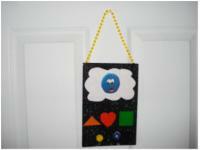 Children can use this chain to hang their Sweet Dream Machine on their bedroom door or next to their bed. 6. Select a series of buttons which may be pressed each night as part of a bedtime ritual. For example, a child could press Red heart/Yellow Circle/Green square, and then add the smiley face. Note: If, for any reason, a child should have a bad dream, sit down with the child and reset his Sweet Dream Machine with a new series of buttons to press.